I have tertiary qualifications in exercise physiology and graphic design. 2003 Advanced Diploma of Graphic Design, Canberra Institute of Technology. 2002 Certificate IV in Graphic Design, Northern Territory University. 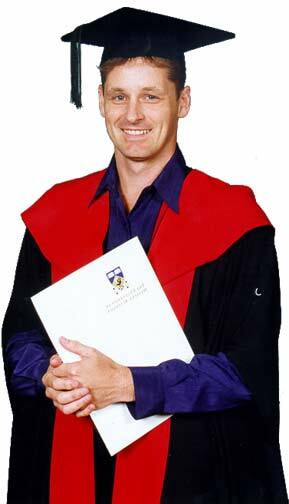 1991	Bachelor of Science (Hons, 1st class), Department of Human Movement and Exercise Science, The University of Western Australia. honours thesis: 'Ergogenic effect of sodium bicarbonate ingestion on well-trained 400/800m runners'. 1995-present: Web Design and management of personal websites. - design of websites and writing content. SEO and web promotion. 2004-present: Graphic Design Consulting - logo, letterhead, business card designs, and advertising and brochure designs. 2004 Graphic Designer at the Exhibition Centre - mostly design of posters and banners for government clients. 2001-2 Senior Sport Scientist / Sport Science Manager at the Northern Territory Institute of Sport:duties include staff supervision, fitness testing of athletes, conducting research, coordinating strength and conditioning services. 1999-01 Sport Scientist at the Northern Territory Institute of Sport: duties include fitness testing of athletes, conducting research, laboratory management. 2002- Sport Science consultant for Tenpin Bowling Australia: lectures to national coaches and squads. 1996-98 Casual Exercise Physiologist for LifeCare Sports Medicine Clinic, Challenge Stadium: duties include ECG stress testing, exercise asthma testing, fitness appraisals, exercise programming, injury rehabilitation, corporate and sporting presentations. 1998 Centre for Athletic Testing at The University of Western Australia: coordinating and performing physiological testing of athletes. 1993-98 Tutor and Examiner at The University of Western Australia: 2nd year Exercise Physiology laboratory classes and 3rd year Research Methods class. 1991-5 Casual Exercise Physiologist at the West Australian Institute of Sport: duties include physiological testing, data base entry and report writing. 1995 Talent Search Program at the West Australian Institute of Sport: conducting of physiological field tests at schools and in the WAIS laboratory as part of the national talent identification program. 1992 Post-graduate Scholar at the Australian Institute of Sport: duties included conducting physiological testing, preparing reports for coaches and athletes, and completion of a research project, entitled "The effect of 650 m altitude on rowing ergometer performance". 2013 - completed 'Writing for the Web' online course on open2study.com.